With so many flooring options available today, it isn’t surprising to be a little confused when choosing which flooring type to select and which flooring contractor in Frisco TX to hire. Finding the best contractor usually depends on the kind of work you need done. What services do you need and what services do they offer? Are they local and have they done this kind of work before? What can you expect when hiring a flooring contractor in Frisco TX? A flooring contractor should have ample experience when it comes to installing your kind of flooring, whether it’s a carpet, tile, hardwood or laminate. Each type requires special handling to ensure perfect installation. Ask your contractor whether they’ve done the same job before and if possible, seek references to verify their expertise. Note that if you’re having work done on a commercial property, it’s best to find a contractor with experience in the same field. Commercial properties usually require more time and resources that can be tough to handle for home flooring contractors. You should also inquire whether they perform repairs in the event of problems. Calling on the same contractors who installed the flooring for repairs usually produces a more refined job. Not only that but you may also get a discount due to loyalty! How long will the work take and what happens if there are any delays. What will the flooring contractor do to minimize and mitigate the delays? Although you can’t expect it done overnight, a good contractor would have the necessary skill set, crew, vendors, and contacts to be able to establish an acceptable timetable. Make sure to talk to them about this, especially if you are also working on a deadline. Delays can be costly so try to reach an understanding with the contractor before a problem arises. Ask for references to find out the company’s past experience. Talking to people who have been serviced by the same company gives you a good idea of how they work, their ethics, the fairness of their prices and the satisfactory results of their job. It is best if you make a list of available contractors in your area and compare the different contractors to determine which one provides you with the best value for your hard earned money. Use what you can find on the internet to help you get started in your research and comparison but it should not be your only source of information. Always take the time to peruse the contract before signing anything. Take a sufficient amount of your time to make the proper selection of both the flooring type and the flooring contractor that you wish to work with and here is one last “rule of thumb” to consider: Trust Your Gut! If you feel even the slightest bit uncomfortable and you have that “gut feeling” that it is the wrong choice, do not ignore that instinct. 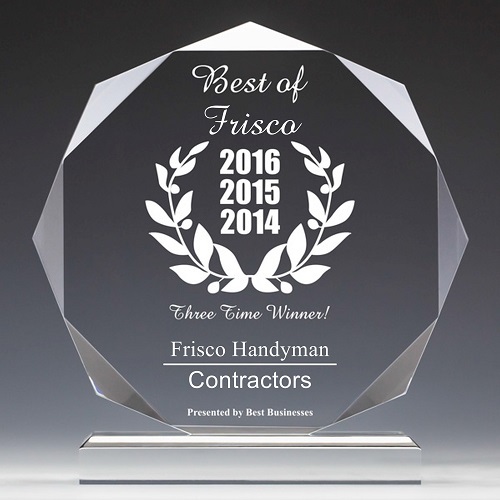 Frisco Handyman is a qualified flooring contractor in Frisco TX and “We Are Here To Help You”. But, you must feel comfortable in your decision so please call or contact us today and ask for your free assessment and estimate, and ask questions – we would be glad to answer them.